If Troy Williams owned a newspaper, he would print a special edition with a 4-inch headline that shouts “Independent Pharmacy Opens!” with the subhead “A First in Almost 70 Years.” That’s how newsworthy the opening of Bloomington’s Axline Pharmacy is, in his opinion. “This just doesn’t happen all that often anymore,” explains the pharmacist/owner of the retail pharmacy located in the Towanda Plaza in Bloomington. In reality, the special edition would have been produced last year, as the pharmacy quietly opened in April 2013. Williams and the rest of the Axline staff have been growing their client base slowly but surely over the last year, mostly through word-of-mouth — that and outstanding customer service. Axline was founded on the old-fashioned value of personal relationships. “Our patients know that when they come in, the pharmacist is going to talk with them face-to-face, whether it’s to answer a question, follow up regarding the effectiveness of a medication, or simply chat about life,” says Williams. With a curb-to-pharmacist distance of about 10 steps, it’s easy for customers to engage in a conversation as soon as they enter the store. The pharmacy itself doesn’t look or feel like a typical pharmacy. Instead of aisle after aisle of beauty products, toys, and candy, Axline offers just a few shelves stocked with prescription-associated products such as bandages, ointments, and other medical supplies. Comfortable chairs, dark wood decorative panels, pendant lights, and large windows allowing natural light create a friendly, professional ambiance — with carpet instead of cold tile, gentle lighting rather than fluorescent lights, and a pharmacist who will remember your name and welcome you as soon as you walk through the door. It all hearkens back to a time when old-fashioned service was just the way things were done. That feeling, the “old-fashioned service,” is intentional, according to Rob Bean, the chief pharmacist. “Our motto is ‘Uniquely Independent’ because we want our customers to experience a pharmacy the way it should be, with face-to-face interaction with the pharmacist and staff every time they come in or call with questions or concerns.” The result is a personal, caring environment that focuses on the needs of the customer. “This machine is amazingly accurate,” says Bean. “It even prompts us if an extra pill gets blown into the bottle. It’s a great timesaver in the filling process, again allowing us more time for patient interaction.” Even for medications not in the ParataMini, Axline utilizes a high-tech scale, barcodes, and labels that have internal system checks to make sure the medication and dosage are correct. All which minimize the opportunity for incorrect medications or dosages for the customer. 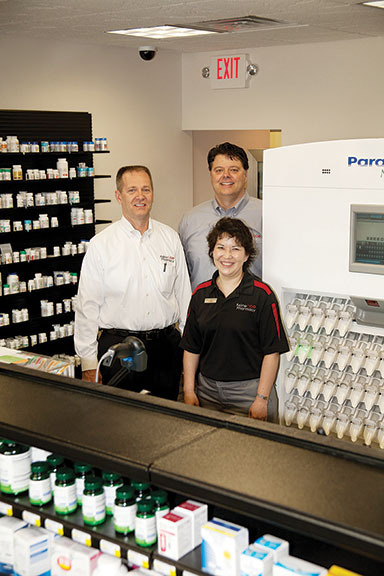 Both Williams and Bean believe the technology allows them to do what they, as pharmacists, are trained to do, and what really they love to do: interact with the customer and be an advocate in any way they can. “We do what it takes to satisfy the customer,” says Bean. That includes looking up discount coupons, answering questions, solving co-pay problems, and finding the most economical way for the patient to get the medication. Axline Pharmacy originated in Monmouth, Illinois, in 1927. When Bill Axline, the store’s second-generation pharmacist and a University of Iowa alum, began contemplating retirement, he returned to his alma mater to recruit a pharmacist who would carry on the business with the same small town values that made it successful. There he met Troy Williams, a pharmacy student who, ironically enough, hailed from Cuba, Illinois, a small town about 60 miles to the southeast of Monmouth. Even in college, Williams knew he was better suited for retail pharmacy rather than drug development. “It became clear early on that my passion leaned toward interacting with and serving customers, not toiling in a lab,” says Williams. Although Williams did not go to work for Bill Axline right out of college in 1993, they did stay in touch over the years. Williams learned a lot through the experience, not only with the Monmouth store, but also with the addition of a second store in Roseville. The learning curve for owning and managing multiple sites was steep, but invaluable. 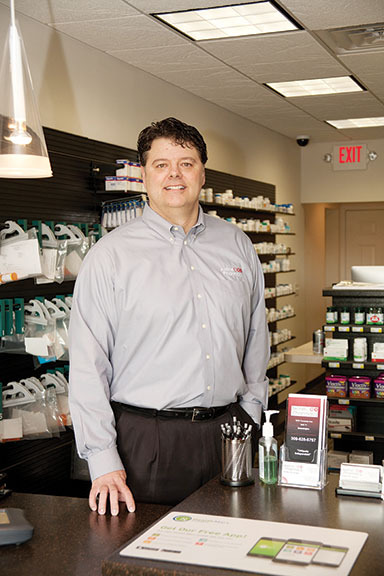 He has learned well, as Axline now has retail pharmacies in three other Central Illinois communities, including Bloomington, Flanagan, and Granville. Interestingly, the pharmacy in Granville is the same store where Rob Bean worked as a teen in high school. “That’s where I learned how to treat people — from the independent pharmacist who took me under his wing,” he says. 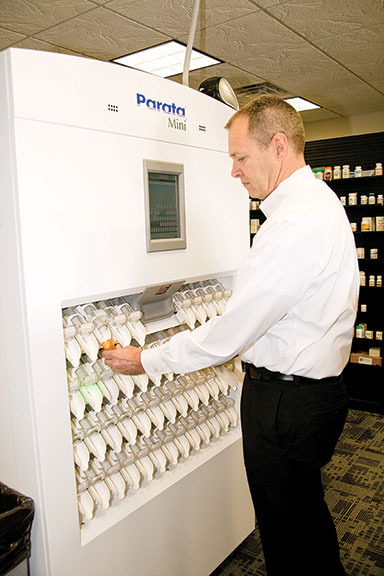 Now he’s come full circle, back to an independent retail pharmacy where he can interact with customers and has the autonomy to inform and offer customers the most economical option to provide what they need. 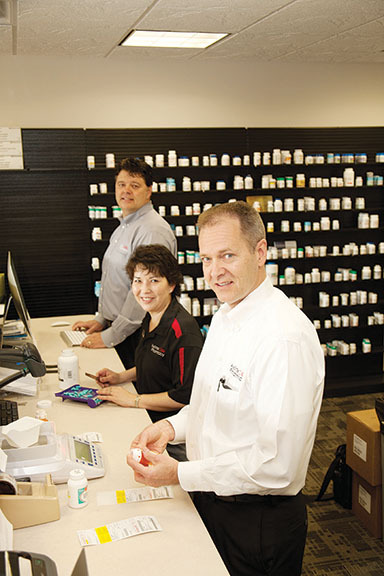 Although Axline Pharmacy is relatively new in town, both Williams and Bean have been pharmacists in Bloomington-Normal for more than 20 years. 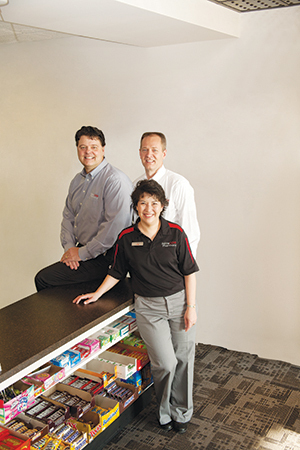 Williams worked with Bean at a local grocery store-based pharmacy right out of college, then for another independent prior to buying the Axline stores. Bean was the manager at the grocery pharmacy, and most recently worked in a local hospital pharmacy. They’ve lived here, raised their families here, and understand the needs and concerns of the people they serve — because they’ve been here. “We see our customers as neighbors, friends, fellow citizens… and we care about them,” says Williams. In addition to the retail stores, Axline has two “closed door” pharmacies, one in Roseville, the other in Bloomington, right next door to the retail store. The closed door facilities represented a whole new world for Williams. These pharmacies serve nursing homes, assisted living facilities, jails, group homes, and similar organizations that care for patients on a contractual basis. “Our Bloomington closed door facility provides medications to about 1000 patients in Central Illinois, including facilities in Pontiac, Flanagan, Ottawa, Roseville, Peoria, Galesburg, and Bloomington. A huge benefit Axline offers to these facilities is called “strip packaging” which is filled, labeled, and checked by the Parata PacMed (the big brother to the Parata Mini in the retail store). 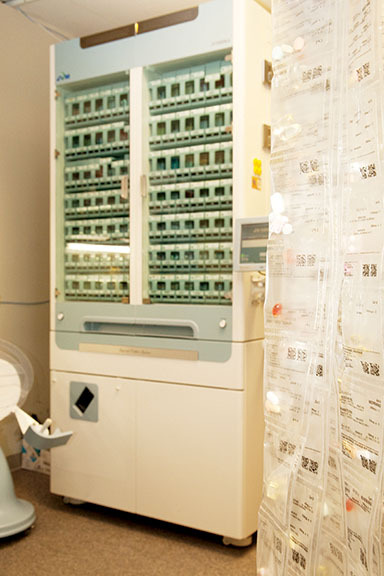 Each patient’s medication is packaged with the day, dose, and time that it should be administered, making disbursal of medications more efficient. Axline offers a similar program for individuals called “Simplify My Meds,” in which every medication is packaged according to when it should be taken. “If you’re supposed to take it at breakfast, the label will tell you that,” says Bean. Another advantage to “Simplify My Meds” is that the customer will never run out — all the prescriptions will be refilled at the same time and will be packaged and labeled as to when they should be taken. Axline Pharmacy is located at 1210 Towanda Avenue, Unit 11 in Bloomington. Contact them at 309-828-6767.